There are 9 comments for this item. I remember that game. Seen a lot of them in thrift stores over the years. Wingslinger...you go to the head of the class!!! LOL! Knew about CRS before, but not CRAFT. And it only took a second to figure it out. In the USAF, CRS was something slightly different. We in the other squadrons joked that CRS (the Component Repair Squadron) stood for "Can't Repair S***." 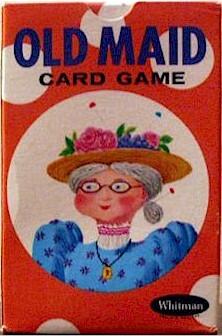 Re: Old Maid...OH!!! Par-doan...I forgot Greassy Grimes...that's wh'cha get for bein' 65 and sufferin' from both C.R.S. AND C.R.A.F.T!!! Thanks, Chris. I feel a trivia question coming on! Tilly Tumble, Lotta Noise, Gusto Graft, Whacky Witch....Those are the only ones I remember...who remembers the rest??? This was more fun than it looked. A great rainy day game. Yeah, I played Old Maid sometimes, but I spent hours and hours playing War. with my sister or my best friend, Art What a worthless game! No skill involved at all. Who doesn't remember playing this as a kid?